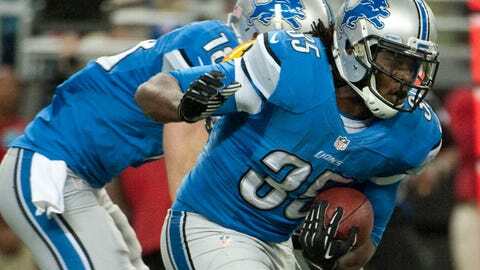 Joique Bell, a restricted free agent, is expected to re-sign with the Lions during the offseason. He went from Broadway Joique to NASDAQ Bell in a matter of hours. After appearing in the Broadway play, Rock of Ages, the previous night, Detroit Lions running back Joique Bell continued his tour of the Big Apple on Thursday. Bell got to ring the opening bell for the NASDAQ stock market in the morning and then made the rounds at the Super Bowl’s Radio Row. "I’m enjoying myself," he told Detroit radio sportscaster Matt Dery Thursday afternoon in New York. "I’m taking it all in." Not bad for a guy who played at Division II Wayne State and wasn’t even drafted coming out of college in 2010. "My hard work is paying off," said Bell, a former security guard for the Lions. He and Reggie Bush became the first running-back combo to both have 500 yards rushing and 500 yards receiving in the same season. Bell, a restricted free agent, is expected to re-sign with the Lions during the offseason. He thinks the contract negotiations will heat up in the next month or so. "I’m passionate about Detroit," Bell told Dery. "I’m passionate about Michigan. We’ve been through a lot. "I’m playing for the fans, for my family. It’s bigger than football. "I am Michigan. Michigan is me." This week, though, he’s been New York, and it looks like he can make it there, too.